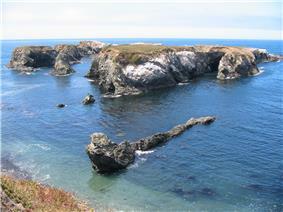 Mendocino County was one of the original counties of California, created in 1850 at the time of statehood. Due to an initially minor white American population, it did not have a separate government until 1859 and was under the administration of Sonoma County prior to that. 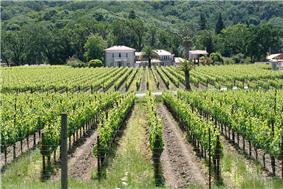 Some of the county's land was given to Sonoma County between 1850 and 1860. 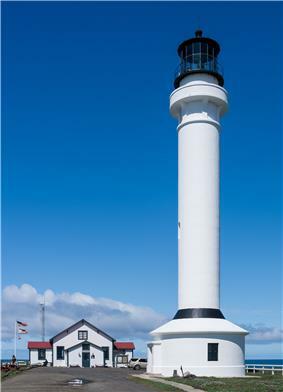 The county derives its name from Cape Mendocino (most of which is actually located in adjacent Humboldt County), which was probably named in honor of either Antonio de Mendoza, Viceroy of New Spain, 1535–1542 (who sent the Juan Rodríguez Cabrillo Expedition to this coast in 1542), or Lorenzo Suárez de Mendoza, Viceroy from 1580 to 1583. Mendocino is the adjectival form of the family name of Mendoza. Neither Spanish nor Mexican influence extended into Mendocino County beyond establishing two Mexican land grants in southern Mendocino County: Rancho Sanel in Hopland, in 1844 and Rancho Yokaya that forms the majority of the Ukiah Valley, in 1845. In the 19th century, despite the establishment of the Mendocino Indian Reservation and Nome Cult Farm in 1856, the county witnessed many of the most serious atrocities in the extermination of the Californian Native American tribes who originally lived in the area, like the Yuki, the Pomo, the Cahto, and the Wintun. The systematic occupation of their lands, the reduction of many of their members into slavery and the raids against their settlements led to the Mendocino War in 1859, where hundreds of Indians were killed. Establishment of the Round Valley Indian Reservation in March 30, 1870, did not prevent the segregation that continued well into the 20th century. Other tribes from the Sierra Nevada mountains were also located to the Round Valley Indian Reservation during the "California Trail Of Tears", where the Natives were forced to march in bad conditions to their new home in Round Valley. Many of these tribes thrown together were not friends with the other tribes they were forced to live with on the reservation, resulting in tensions still evident today. According to the U.S. Census Bureau, the county has a total area of 3,878 square miles (10,040 km2), of which 3,506 square miles (9,080 km2) is land and 372 square miles (960 km2) (9.6%) is water. 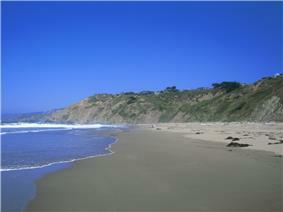 The 2010 United States Census reported that Mendocino County had a population of 87,841. The racial makeup of Mendocino County was 67,218 (76.5%) White, 622 (0.7%) African American, 4,277 (4.9%) Native American, 1,450 (1.7%) Asian, 119 (0.1%) Pacific Islander, 10,185 (11.6%) from other races, and 3,970 (4.5%) from two or more races. Hispanic or Latino of any race were 19,505 persons (22.2%). As of the census of 2000, there were 86,265 people, 33,266 households, and 21,855 families residing in the county. The population density was 25 people per square mile (9/km²). There were 36,937 housing units at an average density of 10 per square mile (4/km²). The racial makeup of the county was 80.8% White, 0.6% Black or African American, 4.8% Native American, 1.2% Asian, 0.2% Pacific Islander, 8.6% from other races, and 3.9% from two or more races. 16.5% of the population were Hispanic or Latino of any race. 12.2% were of German, 10.8% English, 8.6% Irish, 6.1% Italian and 5.6% American ancestry according to Census 2000. 84.4% spoke English and 13.2% Spanish as their first language. There were 33,266 households out of which 31.4% had children under the age of 18 living with them, 48.9% were married couples living together, 11.7% had a female householder with no husband present, and 34.3% were non-families. 27.0% of all households were made up of individuals and 10.4% had someone living alone who was 65 years of age or older. The average household size was 2.53 and the average family size was 3.04. In the county the population was spread out with 25.5% under the age of 18, 8.1% from 18 to 24, 25.6% from 25 to 44, 27.1% from 45 to 64, and 13.6% who were 65 years of age or older. The median age was 39 years. For every 100 females there were 98.9 males. For every 100 females age 18 and over, there were 97.1 males. The median income for a household in the county was $35,996, and the median income for a family was $42,168. Males had a median income of $33,128 versus $23,774 for females. The per capita income for the county was $19,443. About 10.9% of families and 15.9% of the population were below the poverty line, including 21.5% of those under age 18 and 7.7% of those age 65 or over. As of 2015, the district attorney of Mendocino County is C. David Eyster, the elected sheriff-coroner is Thomas D. Allman, and the chief executive officer is Carmel J. Angelo. 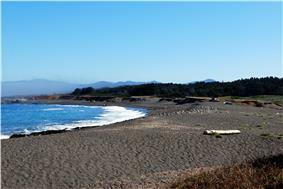 Mendocino County is legislatively governed by a board of five supervisors, each with a separate district. The first district is represented by Carre Brown, and serves the central-eastern region of the county, including Potter Valley, Redwood Valley, Calpella, and Talmage. The second district, represented by John McCowen, serves Ukiah. The third district, in the northeastern quadrant of the county from Willits north to Laytonville and Covelo, is represented by Tom Woodhouse. The fourth district covers the northwestern quadrant of the county, including the coast from Caspar northwards through Fort Bragg; its supervisor is Dan Gjerde, who previously served on the Fort Bragg City Council. The supervisor for the fifth district is Dan Hamburg; his district covers the southern portion of the county, including the coast from Mendocino to Gualala, the Anderson Valley, the western outskirts of Ukiah, and portions of the Russian River valley near Hopland. Hamburg also previously served as a county supervisor, and also served one term as a Congressman in Washington, D.C.
Mendocino is a strongly Democratic county in Presidential and congressional elections. The last Republican to win a majority in the county was Ronald Reagan in 1980 and 1984. Federally, Mendocino County is in California's 2nd congressional district, represented by Democrat Jared Huffman. In the state legislature Mendocino is in the 2nd Senate District, represented by Democrat Mike McGuire, and the 2nd Assembly District, represented by Democrat Jim Wood. As of April 2008, the California Secretary of State reports that Mendocino County has 47,168 registered voters. Of those, 22,264 (47.2%) are registered Democratic; 11,422 (24.2%) are registered Republican; 4,179 (8.9%) are registered with other political parties, and 9,303 (19.7%) declined to state a political party. In 2000, Mendocino County voters approved Measure G, which calls for the decriminalization of marijuana when used and cultivated for personal use. Measure G passed with a 58% majority vote, making it the first county in the United States to declare prosecution of small-scale marijuana offenses the "lowest priority" for local law enforcement. Measure G does not protect individuals who cultivate, transport or possess marijuana for sale. However, Measure G was passed at the local government level affecting only Mendocino County, and therefore does not affect existing state or federal laws. The city of Berkeley has had a similar law (known as the Berkeley Marijuana Initiative II) since 1979 which has generally been found to be unenforceable. In 2008, the Mendocino County Board of Supervisors placed Measure B on the June 3 county-wide ballot. After three months of hard-fought campaigning and national attention, voters narrowly approved "B", which repealed the provisions of 2000's Measure G. However, opponents of Measure B intend to continue the challenge in court, as the wording of Measure B relies heavily on S.B. 420's state limitations which were recently ruled unconstitutional by the California supreme court. On July 3, the Sheriff and District Attorneys offices announced that they would not be enforcing the new regulations for the time being, citing pending legal challenges and conflicts with existing state law. In April, 2009, Sheriff Tom Allman issued his department's medical marijuana enforcement policy, which includes the provisions of Measure B and also cites the California Supreme Court Ruling narrowly defining "caregiver" in the state's medical marijuana law. In 2004, genetically modified organisms. On Nov. 4, 2008 Mendocino County voted 63.2% against Proposition 8 which amended the California Constitution to define marriage as a union between one man and one woman. The Mendocino Transit Authority provides local and intercity bus service within Mendocino County. Limited service also connects with transit in Sonoma County. Greyhound Bus Lines currently serves Ukiah. Amtrak's operates connecting bus service to Ukiah, Willits and Laytonville. 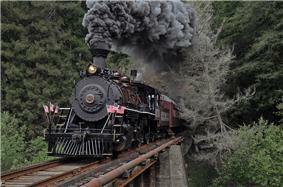 The historic Skunk Train is a heritage railway that connects Fort Bragg, California with Willits using steam locomotives. Ukiah Municipal Airport is a general aviation airport owned by the City of Ukiah. 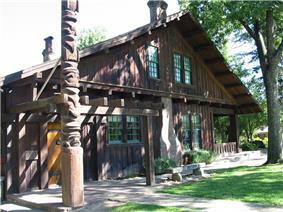 It is located south of downtown Ukiah. 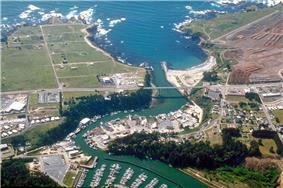 Little River Airport is a general aviation airport serving the Mendocino coast. Willits Municipal Airport is a general aviation airport serving the Willits / Little Lake Valley area. 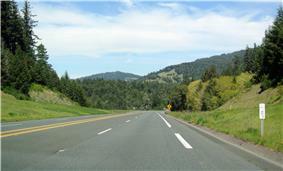 Located in the Brooktrails subdivision area west of Willits. Round Valley Airport is a general aviation airport serving the Covelo / Round Valley area. For commercial service, passengers in Mendocino County need to go to Eureka, one county to the north in Humboldt County, or to Sonoma County Airport in Santa Rosa, Sonoma County, one county to the south. 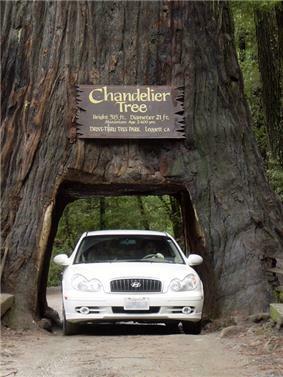 More comprehensive service is available from Sacramento to the east or San Francisco, well to the south. Emergency services for the largely unincorporated county are coordinated through Howard Forest Station, a local Cal Fire station just south of Willits. Mendocino County has nine Indian reservations lying within its borders, the fourth most of any county in the United States (after San Diego County, California; Sandoval County, New Mexico; and Riverside County, California). Kate McGarrigle's song "(Talk to Me of) Mendocino," is one of the songs on the McGarrigles' 1975 debut album; it has been covered by Linda Ronstadt on her 1982 album Get Closer, and by the English singer-songwriter John Howard on his 2007 E.P. ^ "Anthony Peak". Peakbagger.com. Retrieved March 26, 2015. ^ a b "American Fact Finder - Results". ^ a b "State & County QuickFacts". United States Census Bureau. Retrieved September 28, 2015. ^ Regan, Trish (2009-01-23). Marijuana Inc., Inside America's Pot Industry (televised documentary). Mendocino County, California, USA: CNBC, Incorporated. Retrieved 2009-03-15. ^ a b c "History of Mendocino County". 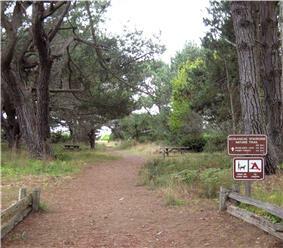 County of Mendocino. Retrieved 3 August 2013. ^ "District Attorney". 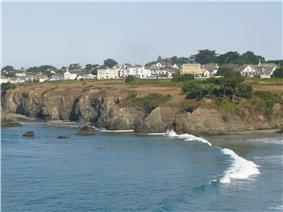 The County of Mendocino. Retrieved March 20, 2015. ^ "Mendocino County Sheriff's Office". Retrieved March 20, 2015. ^ "Executive Office : Welcome". The County of Mendocino. Retrieved March 20, 2015. ^ "Mendocino County district boundaries". Mendocino County Government. Retrieved 21 August 2010. ^ a b c d e "Board of Supervisors - Board Members". Mendocino County. Retrieved February 24, 2015. ^ "Election Summary Report Presidential General Election". Summary For Jurisdiction Wide, All Counters, All Races. County of Mendocino. November 6, 2012. Retrieved 29 April 2014. ^ "Mendocino County, California". political info. epodunk.com. Retrieved 2009-09-23. ^ La Barre, =Suzanne (March 31, 2006). "Legal Limbo for Pot Users?". Berkeley Daily Planet. Retrieved 2009-09-23. ^ "Measure B on the June 3 ballot". Ballotpedia. Retrieved 5 August 2013. ^ Burgess, Rob (21 June 2008). "It's official: Marijuana reform effort passes". Ukiah Daily Journal (Ukiah, CA). Retrieved 5 August 2013. ^ Geniella, Mike (July 3, 2008). "Mendocino County won't enforce pot measure". ^ "Directive on Medical Marijuana 2009-04-03-NO.1" (PDF). Mendocino County Sheriff's Office. April 3, 2009. Retrieved 2009-09-23. California Legislature, Special Joint Committee on the Mendocino War, Majority and Minority Reports of the Special Joint Committee on the Mendocino War. Sacramento, CA: Charles T. Botts, State Printer, 1860. Aurelius O. Carpenter and Percy H. Millberry, History of Mendocino and Lake Counties, California: With Biographical Sketches of the Leading Men and Women of the Counties Who Have Been Identified with their Growth and Development from the Early Days to the Present. Los Angeles, CA: Historic Record Co., 1914. V.K. Chesnut, Plants Used by the Indians of Mendocino County, California. Washington, DC: U.S. Government Printing Office, 1902. Thomas N. Layton, Western Pomo Prehistory: Excavations at Albion Head, Nightbirds' Retreat, and Three Chop Village, Mendocino County, California. Los Angeles, CA: Institute of Archaeology, University of California, Los Angeles, 1990. M.B. Levick, Mendocino County, California. San Francisco, CA: Sunset Magazine Homeseekers' Bureau, n.d. [c. 1912]. Mendocino County Chamber of Commerce, Mendocino County, California. Beverly Hills, CA: Windsor Publications, 1968. Lyman Palmer, History of Mendocino County, California, Comprising Its Geography, Geology, Topography, Climatography, Springs and Timber. San Francisco, CA: Alley, Bowen and Co., 1880. John A. Parducci, Six Decades of Making Wine in Mendocino County, California. Berkeley, CA: Regional Oral History Office, Bancroft Library, University of California, 1992. G. Yoell Parkhurst, Mendocino County, California. San Francisco, CA: Sunset Magazine Homeseekers' Bureau, 1909.